A Form I-9 is a legal document used to verify the identity and employment eligibility of individuals hired for work in the U.S, and I-9 compliance is vital in the current culture. By law via the Immigration Reform and Control Act of 1986, employers are required to ensure the completion and accuracy of the Form I-9 as well as the necessary supporting documentation for all employees. Section One: This part of the form is dedicated to employee information and attestation. An employee is required to complete the form by their first day of employment. Their answers and signature attest that they are being accurate and truthful or they could face perjury penalties. An employer’s obligation for Section One is to ensure the employee completed the section correctly. Section Two: This part of the form deals with employer review and verification. An employer is required to complete Section Two within three business days of an employee’s first day on the job. The employee will provide the required Form I-9 documents for which the company will examine and vouch for the apparent authenticity of the documents and eligibility for employment. Perjury penalties apply to this section as well, in the case that information is falsified. Section Three: This last section is dedicated to reverification and rehires. This section need only be completed when an employee’s work authorization has expired, the employee is rehired within three years of the date of the Form I-9, or if the employee’s name has legally changed. It’s the law. In recent years, the number of Immigration and Customs Enforcement (ICE) worksite investigations into I-9 compliance have quadrupled. Many government and security experts expect this trend to continue. If an ICE audit of a company reveals any infractions, the company will be found not in compliance. ICE audits can occur at any time. Once the audit is in motion, infractions are fined. These fines will vary depending on the infraction itself and other variables such as how many total infractions there are and how many of them are similar in nature. Although it does require time, attention to detail, and strong organization skills, remaining I-9 compliant could save the company from facing hefty fines of thousands of dollars that can negatively affect their bottom line. While the Form I-9 is a single piece of paper, the rules and regulations are not. The government explanation for this form is so detailed that the United States Citizenship and Immigration Services compiled a manual called Handbook for Employers M-274 just for completing it. It is not uncommon for human errors to be made when completing complex government forms, but accurately completing and maintaining I-9 documentation is required to be compliant with ICE. Being out of compliance could earn the offending party a hefty fine and subsequent audits in the ensuing years. 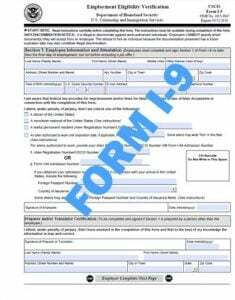 Missing Forms: This infraction generally occurs if the employer fails to complete a Form I-9 or simply misplaces it. Inaccurate Forms: If any required piece of information for this form is answered incorrectly (whether by mistake or intention) or left blank, the employer could be found not in compliance. Missed Deadline for Forms: ICE regulations require that these forms be completed within three business days of an employee’s first day on the job. This time-sensitive deadline can be particularly hard to meet when waiting on an employee to provide identification documents that the employer is then responsible for verifying within the three-day period. Insufficient Identification Documents: Employers must be diligent in collecting all of the appropriate documents. If the documents required for the Form I-9 are not collected, the employer may be found not compliant. With the new E-Verify services, it is now mandated that employers also keep a copy of an employee’s photo identification on file. No Follow Up on I-9 Documentation: If an employee’s citizenship status is in good standing at the time of hire but the documentation has an expiration date for work eligibility in the U.S., it is the employer’s responsibility to stay on top of the situation. They are required to attain new proof of eligibility prior to the expiration date of said documentation. Improper Document Retention: Employers are required to keep an employee’s Form I-9 for at least three years from their date of hire or a year after their termination date. After that time, the law requires that employers destroy those forms and any undestroyed forms found during an audit can result in a fine. WHAT HAPPENS IF YOU ARE NOT I-9 COMPLIANT? Most companies found not to be in Form I-9 compliance are subject to civil or criminal violations. Common civil violations include not complying with Form I-9 employment verification requirements, knowingly hiring an unauthorized alien for employment, continuing to employ an unauthorized alien, committing document abuse, committing document fraud, discriminating against an employment-authorized individual, and failing to notify the Department of Homeland Security of a final non-confirmation of an employee’s employment eligibility. Criminal violations related to not being in Form I-9 compliance can include establishing a pattern of hiring, recruiting, or referring unauthorized aliens for a fee. It is worth noting that in many cases if a company finds themselves not to be I-9 compliant before an audit takes place, effective proactive efforts to rectify the situation begun in good faith could result in some leniency. Staff dedicated to handling I-9 compliance must be organized, efficient, and have an eye for detail. They will be required to oversee the employment verification process in the initial hiring stage, reverification stage, and document retention stage. With the time-sensitive nature of work done in this position, a company with multiple locations may wisely decide to have a dedicated staff member at each to ensure timely I-9 compliance. However, companies are increasingly turning to employment verification services, many of which employ I-9 compliance software. These I-9 software companies are typically able to help companies streamline the employment eligibility verification process. Be User-Friendly: The goal of using a software program is to facilitate the often-complicated Form I-9. It is designed to empower companies to correctly complete a Form I-9 the first time via the use of helpful completion prompts and error notifications. Track Documents and Retention Expiration’s: One of the most time consuming and often forgotten aspects of being I-9 compliant is staying on top of expiring documents and document retention. A good software program should track these trouble areas by providing timely automatic reminder notifications. Provide Centralized Reporting: This software feature can allow management to see a detailed snapshot of a company’s I-9 compliance position at any time instead of waiting until a scheduled bi-annual audit. Avoid Expensive Mistakes: A software program should help minimize human error by prompting users to correct typos and similar errors in real time as the form is completed. This feature helps ensure the Form I-9 is completed with accuracy, which could save a company from expensive fines and penalties related to non-compliance.